This course will better inform the designer about fiber cement siding's physical properties and its benefits, compared to other siding options. The participant will be able to describe the importance of long-term siding performance, and how to extend the longevity of a structure's envelope using new climate zoned cladding. 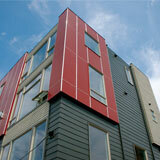 This course also illustrates new panel cladding and the best practices for cutting fiber cement siding.